You would think that if anything were beyond the pale, even for today’s GOP and its conservative base, it would be chattel slavery. Seriously. If there were any thought that ought to be simply unthinkable in twenty first century, America, it would be that it is not simply illegal but actually evil to turn another human being into property. I seem to recall there was something of a disturbance that ended 150 years ago on this matter, and it did not end well for those who lived on stolen labor. I would just say this: … ’30 to 60 days from now anyone who is in the state of Iowa that who is not here legally and who cannot demonstrate their legal status to the satisfaction of the local and state authorities here in the State of Iowa, become property of the State of Iowa.’ So if you are here without our permission, and we have given you two months to leave, and you’re still here, and we find that you’re still here after we we’ve given you the deadline to leave, then you become property of the State of Iowa. And we have a job for you. And we start using compelled labor, the people who are here illegally would therefore be owned by the state and become an asset of the state rather than a liability and we start inventing jobs for them to do. CALLER: Well I think everybody would believe it sounds like slavery? MICKELSON: Well, what’s wrong with slavery? MICKELSON: No this is pretty simple, actually this is very simple, what my solution is moral and it’s legal. And I can’t think – and it’s also politically doable. CALLER: So are you going to house all these people who have chosen to be indentured? MICKELSON: Yes, yes, absolutely in a minimal fashion. We would take a lesson from Sheriff [Joe] Arpaio down in Arizona. Put up a tent village, we feed and water these new assets, we give them minimal shelter, minimal nutrition, and offer them the opportunity to work for the benefit of the taxpayers of the state of Iowa. All they have to do to avoid servitude is to leave. MICKELSON: You think I’m just pulling your leg. I am not…. Ladles and Jellyspoons: your modern Republican party. Somewhere, Abraham Lincoln is weeping. 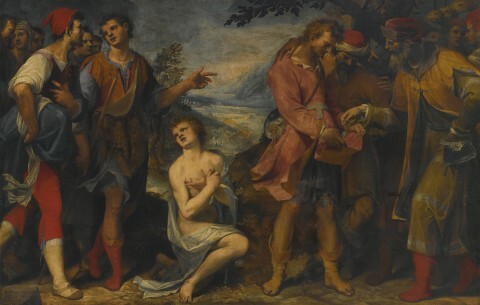 Image: Damiano Mascagni, Joseph sold into slavery by his brothers, 1602.